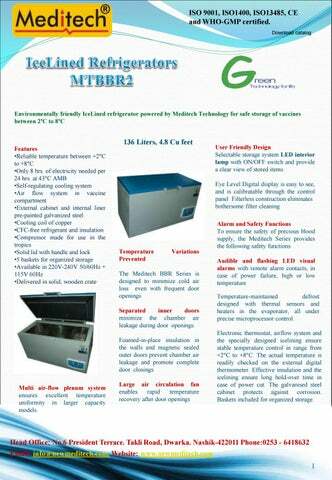 Alarm and Safety Functions To ensure the safety of precious blood supply, the Meditech Series provides the following safety functions Audible and flashing LED visual alarms with remote alarm contacts, in case of power failure, high or low temperature Temperature-maintained defrost designed with thermal sensors and heaters in the evaporator, all under precise microprocessor control. Electronic thermostat, airflow system and the specially designed icelining ensure stable temperature control in range from +2°C to +8°C. The actual temperature is readily checked on the external digital thermometer. Effective insulation and the icelining ensure long hold-over time in case of power cut. The galvanised steel cabinet protects against corrosion. Baskets included for organized storage.